St. Louis, Plaquemines Ports Ink MoU for Mississippi River Cooperation – Inland Rivers, Ports & Terminals, INC.
St. Louis Regional Freightway, Port of Plaquemines and St. Louis Regional Ports Sign Agreement to Foster Economic Growth on the Mississippi River. The pact will help support development of a new transportation link for cargo to move along the Mississippi River. The St. Louis Regional Freightway, Plaquemines Port Harbor & Terminal District located in the State of Louisiana and four ports in the St. Louis region have entered into a Memorandum of Understanding (MOU) to establish and grow an alliance to generate new business by promoting international and inland trade routes at strategic locations along the Mississippi River. The agreement, which represents a five-year commitment, calls for joint marketing initiatives and exchange of data to further those goals. The agreement embodies the St. Louis region’s strong support for the efforts underway by marine transportation services leader American Patriot Holdings, LLC, and the Port of Plaquemines to develop a hub-and-spoke transportation system for container transport vessel shipments from Plaquemines, at the mouth of the Mississippi River just south of New Orleans, to the St. Louis region. Initial discussions have focused on loading operations at a centralized location in Jefferson County, Missouri, with feeder services by rail, barge and truck throughout the bistate region and the Mississippi River Basin resulting in low costs and efficient transportation. On March 27, 2018, representatives from each organization gathered in St. Louis to announce the agreement. Signing the MOU were Sandy Sanders, Executive Director of Plaquemines Port Harbor & Terminal District (Plaquemines Port); Mary C. Lamie, Executive Director of St. Louis Regional Freightway; John M. Nations, President and Chief Executive Officer of Bi-State Development; Dennis Wilmsmeyer, Executive Director of America’s Central Port; Susan Taylor, Port Director of the Port Authority of St. Louis; Ed Weilbacher, General Manager of the Kaskaskia Regional Port District; and Neal Breitweiser, Executive Director of the Jefferson County Port Authority. The MOU follows the signing of an exclusive agreement last year by Plaquemines Port and American Patriot Holdings to provide container service from a future terminal in Plaquemines to destinations as far north as Chicago. The unique American Patriot Holdings’ vessels are patented and will carry up to 2,500 containers at speeds of 13 miles per hour with virtually no wake, making rounds trips possible to Memphis in seven days and to St. Louis in 10 days. The vessels recently completed model testing in Germany, and final engineering and design is underway. Given that progress, American Patriot Holdings and the Port of Plaquemines are exploring where the vessels will stop along the inland waterways, and the St. Louis region is a viable contender. The MOU between the five ports and St. Louis Regional Freightway will help facilitate sharing of marketing activities and enable them to exchange data and findings from marketing studies relative to developing port opportunities. It also offers parties opportunities to share information on improvements and modernization efforts and technological capabilities and programs. Much like the MOU signed in 2017 by the Port of New Orleans and the St. Louis Regional Freightway and America’s Central Port, the Port Authority of St. Louis, and the Kaskaskia Regional Port District, this agreement recognizes that growth at the ports at the mouth of Mississippi River, and future growth around freight movement through the various ports in the St. Louis region, are intrinsically and historically connected. Currently, most of the containers heading to the Midwest are moving by rail from California. 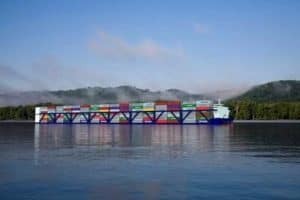 The widened new lane of the Panama Canal has transportation experts looking at less costly options, which include Gulf of Mexico and East coast ports.